Is Camgate going to the next level? This may be the first sign that it’s time to go to DEFCON Four at Auburn. … According to sources connected to the probe … FBI agents looking into the Newton recruiting controversy are also asking about Milton McGregor — a dog track owner arrested last month for allegedly bribing Alabama politicians to vote pro gambling. We’re told agents asked someone connected to the Newton case if he was familiar with McGregor or the bribery scandal. TMZ goes on to say that it doesn’t know what the link between Newton and McGregor might be, but any time you’ve got the FBI bringing somebody arrested into the conversation, it’s not good. Ivy League football is for wusses. Harvard flip-flops on vuvuzelas and bans them from the Yale game… because the Yale Band – excuse me, the Yale Precision Marching Band – is worried it’ll be drowned out by the horns. Personally, I’d like to see everybody that bought one stand outside the stadium at halftime and blow ’em while Yale’s band performs. It’s good to know that Alabama and Auburn fans share one common attitude: when recruitin’ scandals arise, it’s always the result of a vast, dark conspiracy. There aren’t any guilty people in Alabama prisons, either. Just ask the inmates. Amazing how that works. Maybe he’ll ace the Wonderlic. Now the NFL has started hatin’ on Cam. … One director of scouting for an AFC team said Tuesday that Newton will be a first-round pick should he decide to skip his senior season but added that not every franchise will be interested because of his off-the-field issues. “There are going to be questions about the kid,” said the scout, who requested anonymity. “You’re going to want to sit down and do a lot of interviews with him, because he never makes a check or a call at the line of scrimmage. He gets everything from the sidelines, so all that stuff is going to be new to him. Eh, maybe. To me, Newton looks like he’s got Oakland Raiders written all over him. At worst, he’ll be JaMarcus Russell without a purple drank problem. Aaron Murray is so banged up from the Auburn game he can’t practice. 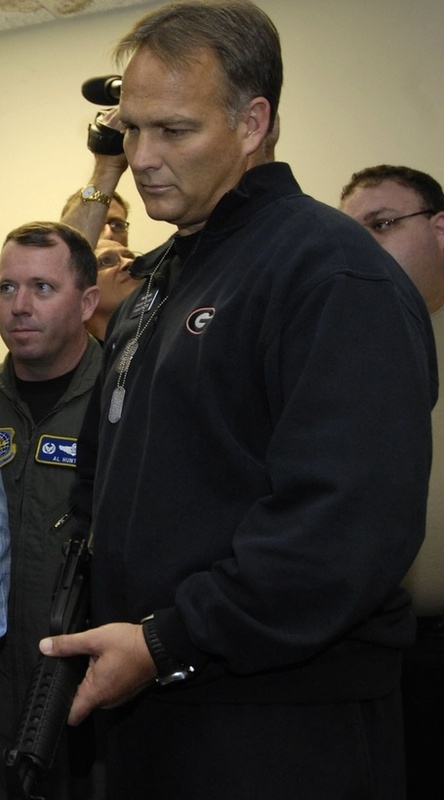 Greg McGarity is seething about the SEC’s decision not to suspend Nick Fairley for his cheap shot to Murray’s spine. But Kevin Scarbinsky thinks the conference got the call right. And he points to his wing man for backup on that. … The people who’ve joined the Dirty Fairley campaign should stop and listen to Buck Belue. You know things have gotten crazy when the former Georgia quarterback, now an Atlanta radio host, becomes the voice of reason. It’s really a compliment. You don’t become the front-runner for the Lombardi Award by sending quarterbacks flowers. You do it by planting them. Not the flowers. The quarterbacks. Note to both: the anger isn’t over the jersey Fairley wears. It’s over selective enforcement by the SEC. Ben Jones gets a half-game suspension for a cheap shot in the Mississippi State game. Fairley gets a finger wag and a pat on the back for something at least as egregious. But at least Buck’s getting quoted in the media. UPDATE: Mr. Conventional Wisdom writes something today that I truly don’t get. … If Fairley puts the same kind of hit on the Alabama quarterback as he did on Murray, there is decent chance he gets tossed. Why? Because fair or not, Nick Fairley will be a marked man against Alabama because of what happened against Georgia. The officials, whose No. 1 job is to keep control of the game, won’t let this one get out of control like Georgia-Auburn did at the end. And if some players have to be tossed to maintain order, so be it. So the issue for Barnhart (and by extension the SEC office) isn’t player safety, but keeping order on the field? These guys sure have a weird sense of priorities. And if that’s truly the case, why didn’t Fairley get ejected in the Georgia game? Danielson commented early on about how chippy players on both teams were behaving. The refs had to know there was plenty of emotion on the field. It’s just different in Athens. Emerge from an alley the wrong way, keep quiet about your middle name, commit a traffic violation on a scooter – do any of that stuff in the Classic City and you’re likely to become Public Enemy No. 1. The Red and Black will call for your hide (and your head coach’s). Do that kind of stuff elsewhere, though? No big deal. In some places, they even make you a public spokesperson for a traffic safety campaign. He looks pretty serious with a weapon in his hands, doesn’t he?